The series is equipped with Skylake processors and vPro technology with unified docking solutions. Toshiba has revealed its latest lineup for the business-class Portege and Tecra series for a launch in early 2016. The new models range from the 13.3-inch Portege A30-C to the 14-inch Tecra A40-C and 15.6-inch Tecra A50-C. All models can be equipped with matte HD or FHD panels. 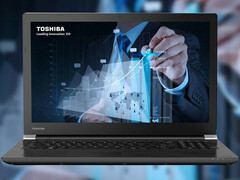 As a key feature for the refresh, Toshiba has focused on usability and compatibility between all of its notebooks. Consequently, the new Portege and Tecra models utilize the same docking connector and can share the same docking accessories. The notebooks have been tested to resist drops up to a certain height and offer protection again splashing liquids. Depending on the configuration, the notebooks can also be equipped with a fingerprint sensor, Trusted Mobile Platform (TPM) 2.01, and integrated Smart Card reader. Skylake will be standard amongst the models as expected. The manufacturer promises a full refund or free repairs should the unit become damaged within its first year of warranty.